Despite its status as a big bank, Bank of America does not offer the highest-earning interest rates, often not even coming close to the high rates of many online banks. Because of this, opening a savings account with Bank of America may be better for those not too determined to grow their money. BoA may be better suited as an accompanying account to a bank account you already have. However, it is notable that the bank offers a number of different banking products. From two kinds of savings accounts to almost 10 certificates of deposit, there is no shortage of accounts here. This means that no matter your spending or saving type, there’s likely an account to suit your needs. If you’re eager to save and save big, though, you’ll want to look elsewhere. Of note, Bank of America has a particularly robust selection of individual retirement account (IRA) products, from a Money Market IRA to a Variable Rate CD IRA. Read on below to find out about Bank of America's banking options. With humble beginnings in 1904 as the Bank of Italy, the Bank of America of today has expanded worldwide. Not only that, but its offerings of banking products have grown to include home loans, auto loans, investment opportunities with Merrill Lynch and more. This aligns with the company’s goal to provide financial products and insights for customers’ every financial need. What Bank of America lacks in interest rate strength, it makes up for in a few different ways. For one, it has a long list of savings account options from the Regular Savings Account to the Core Checking® Account to individual retirement accounts (IRAs). That way you’re not stuck choosing between a basic savings account and a money market account, for example. Bank of America is also able to provide its customers and potential customers with thousands of physical branches and ATMs. Plus, if you don’t want or need to visit your local branch, you have the option of banking completely online. The bank provides 24/7 online and award-winning mobile access to your bank accounts. Access to Your Savings Account Online, mobile and text banking; thousands of ATMs and branches. Security FDIC-insured deposits up to the legal limit. The Bank of America Rewards Savings Account, previously the Bank of America Rewards Money Market Savings Account, provides an opportunity to save more than with a basic savings account at Bank of America. You can especially save more when you are a Preferred Rewards member, earning at higher interest rates. Plus, you can avoid the monthly fee of $8 as a Preferred Rewards member. You can also avoid this fee by maintaining a minimum daily balance of at least $500 or linking your Bank of America Interest Checking® account. Access to Your CD Online, mobile and text banking; thousands of ATMs and branches. Fees No account maintenance fees. You will face a penalty if you choose to withdraw from your CD before its maturity date. Bank of America offers two certificate of deposit (CD) accounts, the Featured CD Account and the Standard Term CD Account. If you’re unfamiliar with CDs, they are another way to put money away to grow for future use. You make one original deposit to the account and you cannot withdraw any of the savings until the CDs specific term is over. The Bank of America Featured CD Account carries a term length of 12 months. This means that after your initial deposit, you cannot touch the account’s funds until a year later. Your money will grow according to a 0.07% APY. While this APY lands higher than the Regular Savings Account, many other banks we review have higher-earning accounts. The same goes for the Bank of America Standard CD rates. The highest APY you can get with the longer CD terms falls at 0.75%, while many other banks offer much higher rates for shorter terms. To gain access to a Bank of America CD, you will need to meet the minimum deposit amounts which are a little high. The Featured CD especially has a high minimum deposit requirement at $10,000. This means you need to have at least $10,000 to open a Featured CD and begin earning interest. Whichever CD you choose to open, it will automatically renew for another term length after maturity unless you take action to withdraw your funds. If it’s been awhile since you opened your CD and you don’t know its maturity date, no need to worry. The bank will send you a notice before the date so you can take any necessary steps. These notices may also inform you of any changes the bank has made to the terms of your CD. Don’t forget that you can only withdraw your savings after the account’s maturity. If you choose to bypass that rule, you’ll meet early withdrawal penalties. For CDs of less than 90 days, the penalty will be the greater of all interest earned on the amount withdrawn or an amount equal to seven days’ interest on the amount withdrawn. For CDs between 90 days and 12 months, the penalty equals the amount of 90 days’ interest on the amount withdrawn. For CDs with terms of 12 months to 60 months, the penalty is an amount equal to 180 days’ interest on the amount withdrawn. Finally, for CDs of 60 months or longer, the penalty equals 365 days’ worth of interest on the amount withdrawn. It’s good to keep in mind that you’ll lose much of what you earned in interest if you withdraw early. Access to Your Checking Account Online, mobile and text banking; thousands of ATMs and branches. Security Your debit card comes with secure chip technology and photo security® to help prevent fraud. The bank will also review how and where your card is being used to catch fraudulent usage as soon as possible. If your debit card is lost or stolen, you can lock the card on your smartphone app or online and unlock it when it’s found. Bank of America also offers a $0 Liability Guarantee which will credit fraudulent transactions made with your debit card back to you. Bank of America SafeBalance Banking® Account: $4.95 monthly fee. The Core Checking® Account and Interest Checking® Account both come with a fee of $2.50 per transaction for the use of a non-Bank of America ATM in the U.S. and a fee of $5 per transaction for the use of a non-Bank of America ATM outside of the U.S. Included in Bank of America’s wide-ranging banking offerings are, of course, two checking accounts. The first, the Bank of America Core Checking® Account is the more basic account since it does not earn interest. The account comes with a $12 monthly maintenance fee. However, there are a few ways to avoid this fee. If you have at least one qualifying direct deposit of $250 or more, maintain a minimum daily balance of at least $1,500 or are a Preferred Rewards client, you can skip the maintenance fee. Plus, as part of Bank of America® Student Banking, students under the age of 24 can avoid the monthly fee. This includes students enrolled in high school, college, university or vocational programs. The Core Checking® Account also provides overdraft protection so you don’t have to worry about being turned away at the register. Overdraft protection fees will apply when you have this account, but not with an Interest Checking® Account. The Bank of America Interest Checking® Account is one of many checking accounts that earn interest on your balance. This account earns at a 0.01% APY if your balance is below $50,000 and at a 0.02% APY for all larger balances. Another plus of this account is that you can snag some services for no extra cost like overdraft protection and standard checks. The account does charge a monthly fee that you can waive by maintaining a combined balance of at least $10,000. The combined balance includes the average daily balance in eligible linked checking, savings and money market savings accounts, the current balances in linked personal CDs and IRAs and the current balance in your eligible linked Merrill Edge® and Merrill Lynch® investment accounts. If you’re looking for a simpler and safer checking account, you can open a Bank of America SafeBalance Banking® Account. This account is tailored toward preventing overdrafts. Bank of America does this by not charging overdraft fees and withholding check-writing abilities. Instead, your transactions are denied and returned unpaid when you don’t have the money in your account to complete the transaction. This helps prevent a negative balance on your account. However, you should still manage your spending and check your account balances regularly. This is especially true since there is no way to waive the account’s $4.95 monthly fee. All three checking accounts do offer some ease in saving through two programs. The Keep the Change® program links your checking account to your savings account. When you make purchases with your debit card, Bank of America will round that purchase up to the nearest dollar. The extra change will go right to your savings account. You also have access to BankAmeriDeals® which provides cash back deals. When you pay for purchases with your debit or credit card you can earn cash back that is debited to your account by the end of the following month. You can access both of these programs through Online and Mobile Banking. Access to Your IRA Online, mobile and text banking; thousands of ATMs and branches. Security FDIC-insured up to the legal limits. Fees No account maintenance fees. Money Market Market IRA: Call 888-827-1812 to determine your accurate rate. Bank of America’s IRA products mirror the bank’s other savings accounts like the Rewards Savings Account, the Featured CD and the Standard CD, respectively. This means that terms and conditions for each account will most likely apply to its IRA counterpart. However, the IRA products will see more tax benefits than a non-retirement savings account. The bank’s IRAs also help you avoid annual and custodial fees, so your retirement savings can go even further. The exception is the Bank of America Variable Rate CD IRA. This CD IRA allows you to earn at a variable rate of interest over a fixed term. You can choose a term length of 18 to 23 months. Unlike most CDs, you can make additional deposits to your Variable Rate CD IRA, even without extending the term. You can easily apply for a Bank of America IRA online if you are already enrolled in online banking. If you are not enrolled or don’t have an existing bank account, you can visit your local bank branch to open an IRA. Should you have questions about IRAs or saving for retirement in general, you may want to speak to a financial advisor. Finding the right financial advisor that fits your needs doesn’t have to be hard. SmartAsset’s free tool will pair you with as many as three financial advisors in your area in five minutes. If you’re ready to be matched with local advisors that can help you achieve your financial goals, get started now. Access to Your Account Online, over the phone, at physical locations. Fees $6.95 per unlimited online equity and ETF trades. Sales are subject to an ETF transaction fee of between $0.01 and $0.03 per $1,000 of principal. Related to Bank of America, Merrill Edge offers a few more IRA options for customers. These accounts, however, are geared toward saving through investing. Although tax-advantaged options, these accounts carry the standard risks that come with investing. Merrill Edge IRAs offer a wider choice of stocks, bonds, ETFs and mutual funds to fill your IRAs. Where Can I Find Bank of America? Bank of America is a nationally recognized financial institution, largely due to its widespread presence. You can find the bank at thousands of ATMs or physical branches throughout 36 states and the District of Columbia. You can open or manage any account at the location nearest to you. 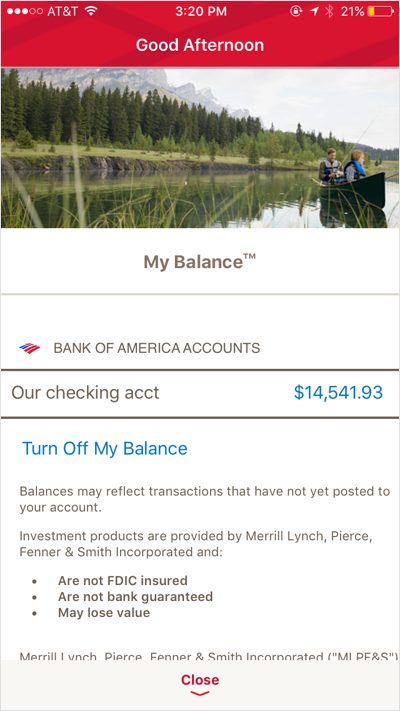 Even if there is no physical location nearby, you can easily head to the Bank of America website to open and manage the bank account(s) you want. Bank of America also has a smartphone app so you can conveniently bank on the go. What Can You Do Online With Bank of America? You can do a lot of your banking online with Bank of America. Unlike many online banks that we review, Bank of America has brick and mortar locations to visit. However, if you want to open an account at your kitchen counter or deposit a check while on your couch, you can do that too. Bank of America has upgraded its online offerings, especially on mobile, to make banking on the go easier and more convenient. You can even pay through your mobile device or lock/unlock your card in the event it gets lost or stolen. The bank’s app also includes Zelle? with which you can quickly send and receive money from friends and family even if they don’t bank with Bank of America. There are a number of ways to access your money in a Bank of America bank account. For starters, you have access to thousands of ATMs and physical branches throughout most of the country. As an alternative, you can take advantage of the bank’s 24/7 online access, call a customer service representative or even send a direct message on Twitter or Facebook. If you go the social media route, however, you shouldn’t share any personal or financial information until you reach a more secure form of communication. If you don’t need the assistance of a customer service representative, you can easily manage and access your money online or on the bank’s mobile app. You can deposit checks on the app by taking a picture of both sides of the check. You can transfer money, pay bills, locate ATMS and branches and receive customized alerts on your mobile app, as well. Shown here is an example image of your mobile account. You can see your checking account balances, your transactions and other balances. How Can I Save More Money With a Bank of America Account? When compared to many of the banks we have reviewed, Bank of America’s savings products don’t have much to offer. The bank’s interest rates don’t really compete with the high rates of many online banks. This is highlighted by Bank of America’s highest APY coming in at 1.00%, a rate that other banks bypass easily. Essentially, you can’t save more with a Bank of America Account than with a savings account at a competitor bank. Bank of America also charges monthly fees for simply holding an account. Many competitors do not charge maintenance fees and offer higher interest rates. It is a plus, though, that when Bank of America does charge monthly account maintenance fees, there are often steps you can take to waive the fee. The bank does offer an opportunity to snag deals and save money with its BankAmeriDeals® program. It provides cash back deals when you pay for purchases with your debit or credit card. The cash back is then debited to your account by the end of the following month. Plus, your mobile app shows you exactly where you can earn these rewards with an interactive map tool. You can also access the program through your online account. What’s the Process for Opening an Account With Bank of America? Bank of America provides a few different ways for you to open an account. 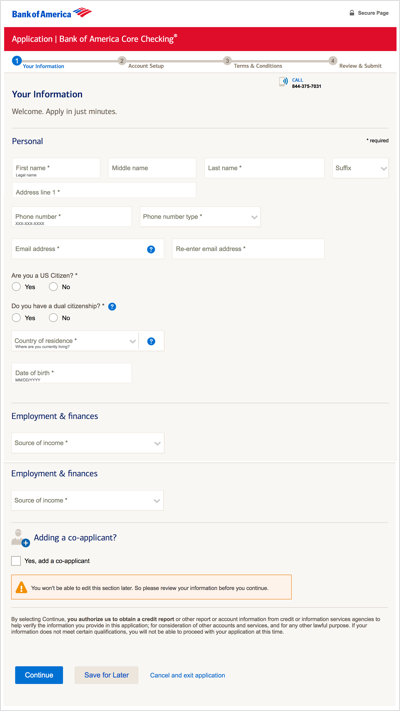 For starters, you can easily apply online, which will take around 10 minutes. All you have to do is find the account you want to open and click the “Open Now” button on the page. This will take you to a page confirming the account you want to open among other choices depending on the account type. This is where you can add an offer code if you have one or log in as an existing Bank of America Online Banking customer. If you are an existing customer, you can log in to prefill and customize your application. Once you fill in your information on the following page and click Continue, you authorize the bank to obtain a credit report and other information to confirm that the information you provided is all correct. The bank states that you should visit a physical branch to open an account if you have limited credit history. This way, you can speak with a representative rather than wait for applications and inquiries to go through online. You should also visit a branch if you have had issues with your checking history or if you’re depositing more than $100,000 into your new account. You can also always give the bank a call at 844-375-7027. No matter which method you choose, you will have to provide personal information to open an account. This includes your Social Security number, your date of birth, phone numbers and addresses (no P.O. boxes) and funding information. The catch to banking with a big bank name like Bank of America is that you don’t get the highest savings rates. On one hand you can consolidate your banking accounts to one institution which offer convenience and ease, but the effort of opening and managing savings account may not be worth the results you see with the bank’s low APYs. Especially in today’s economy, where saving for retirement or your next big expense is increasingly important, you may want to look elsewhere for bigger savings returns. If you’re looking to open a number of bank accounts with the same big name institution, Bank of America could be the right choice for you. Not only can you choose between a few simple checking and savings accounts, but you can also start funding your retirement with one of the bank’s IRAs. If you want to maximize your savings, however, you should look elsewhere for a high-earning savings rate. With the highest APY of 1.00%, Bank of America doesn’t offer the most competitive rates, meaning your savings will take a while to grow.